Connie: Before joining LIVESTRONG.COM I had been overweight my entire life. I did not exercise, and I never paid attention to what or how much I ate. I was unhappy with the size of my body, but I felt powerless to change it. LIVESTRONG.COM: What was your inspiration to make a change? Connie: My then-11-year-old high-functioning autistic son wanted to join the school football team. He was overweight and out of shape. His therapist was encouraging him to play football and working with him in order to get him prepared. One day my son’s therapist told me that the only way Timothy was going to succeed at losing weight and getting in better shape so that he could play football was if I modeled that behavior for him. In order to succeed, he needed to see me follow those behaviors and make those healthier lifestyle choices. I knew his therapist was right, and I knew how much my son wanted to play football. I made the decision to change my lifestyle to help him change his. We started getting healthier, including running 5Ks together. Connie: I found the LIVESTRONG.COM MyPlate Calorie Tracker and thought it would be a great way to monitor my calories. I downloaded the app and found it incredibly easy to log my daily calories consumed and track my daily exercise. I focused on always making sure to eat less than I burned. Connie: At first I only worked out at the gym. I would walk on the treadmill for cardio and use the weight machines for strength training. My son’s therapist encouraged me to sign my son up for a 5K and run it with him, so that’s what we did. We walked most of it, but I decided right then that I wanted to start running. I began with very short distances, but I have been persistently building on that for the past year. Last year I ran in nine 5Ks, and so far this year I’ve completed two 5Ks and one 10-mile race. Connie: Currently I run three miles a day, five days a week, and I do five miles on the weekend. Connie: I eat three meals and two to three snacks a day. I love starting my mornings with oatmeal. My favorite snacks are almonds and berries. My favorite food tip is to replace traditional pasta with shredded or spiralized zucchini. Connie: My calorie consumption is based on my exercise that day. I eat less on my rest days and more on days that I run five miles, for instance. Currently, I’m maintaining my weight and just focused on not gaining, rather than losing more weight. Connie: I always have berries, almonds, oatmeal, spinach and zucchini on hand in my kitchen. Connie: I plan my meals in advance, and I shop for groceries once a week. Connie: It’s not easy to change your life, but it’s definitely worth the effort. The more you stick with the positive changes, the easier they become — until eventually they become second nature. Consistency is the key. If you go too many days without exercising, for instance, it’s much harder to get started again. If you eat too many unhealthy foods, it’s easy to start craving them again. While someone or something might motivate you to make positive changes in your life, you have to want them for yourself as well if the changes you make are to be lasting. Connie: To me it boiled down to a simple math equation. I knew I needed to burn more calories than I ate. When I looked at it like that, I knew I could do it. On days that I wanted to eat more I just made sure that I exercised more to offset those extra calories I consumed. 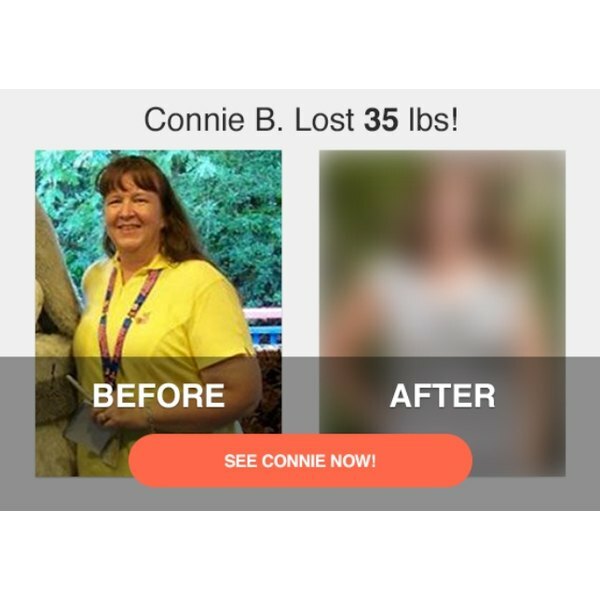 Connie: Since losing weight I have gained a self-confidence that I never had before. I am comfortable with the way I look. Losing weight gave me the confidence I needed to begin a running program as well. Although I no longer track my calories and exercise in MyPlate on a daily basis now that it has become second nature for me, I still enjoy reading the LIVESTRONG.COM newsletters. I find great encouragement from reading the success stories of others who have lost weight. I simply try to eat healthy and run daily. LIVESTRONG Success Story: David M.
How Julia D. Lost 39 Pounds and Four Sizes!